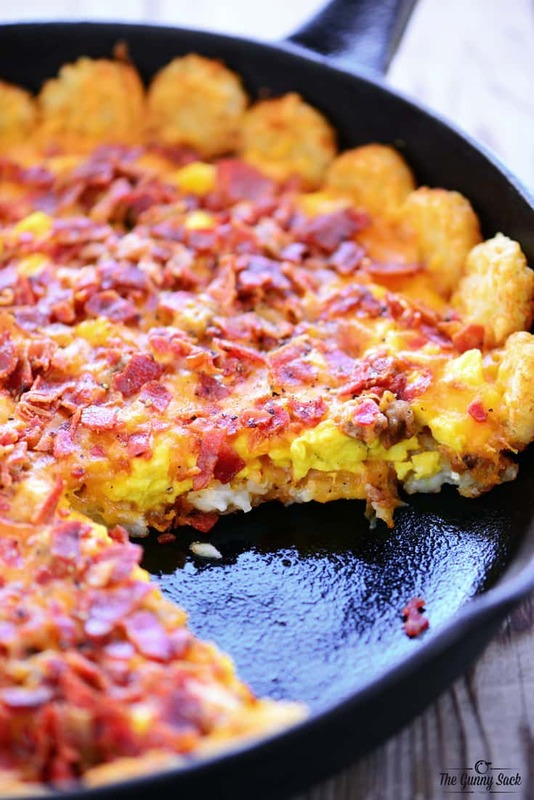 Tater Tot Chicken Pot Pie because admit it…pie crust is boring. The whole family will love this spin on the traditional chicken pot pie recipe. I’ve got something to admit…I don’t really like pie crust. It’s typically rather bland and tasteless, especially when compared to the filling. Often times when used for things like chicken pot pie it ends up getting soggy (so I use puff pastry) and when used for a French silk pie it doesn’t have a chance of competing with the chocolate. So today I am sharing a recipe for a chicken pot pie that has tater tots in place of pie crust. 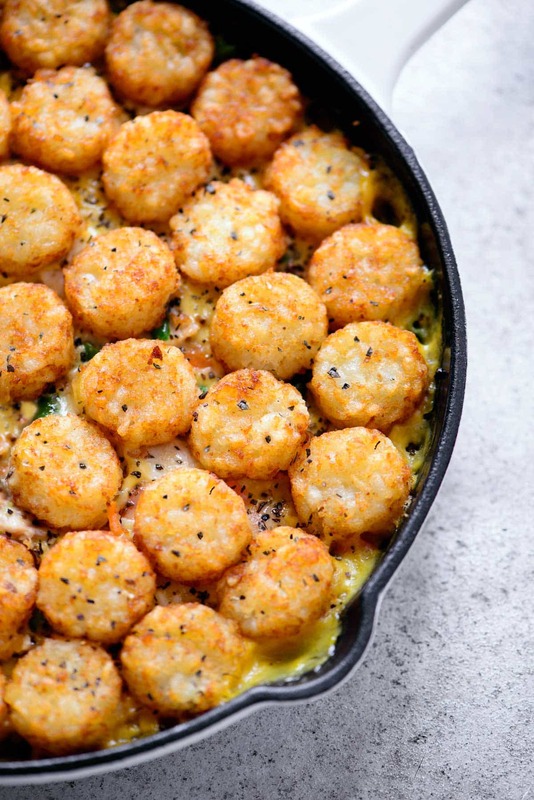 The tater tots go on top of the chicken pot pie filling so that they get crispy in the oven. 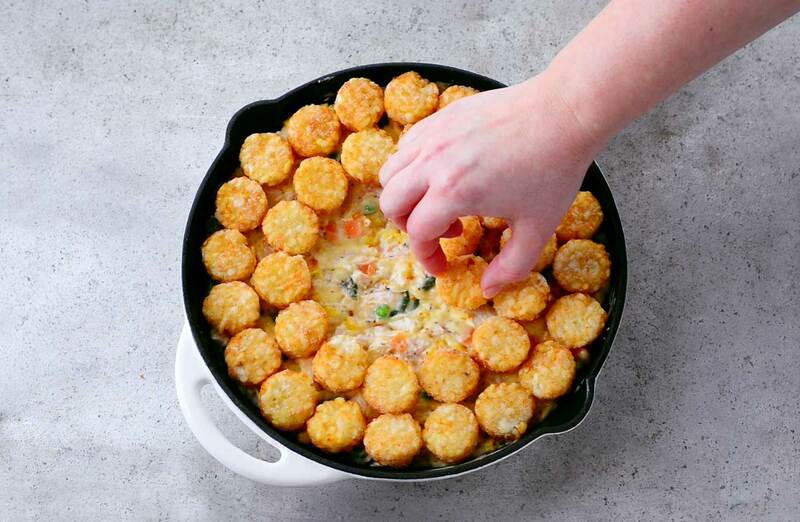 To make this Tater Tot Chicken Pot Pie, I took several shortcuts. 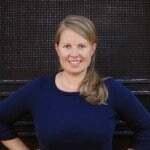 For the chicken, I used a store-bought rotisserie chicken. For the veggies, I used a bag of frozen corn, carrots, peas and beans. I thawed them in the microwave for two minutes but didn’t cook them fully. For the cream of chicken soup, I used a can of Campbell’s and the minced onion in the dried kind. Cut the chicken into bite-sized pieces and put them in a baking dish. I used 10-inch cast iron skillet. Add mixed veggies, cream of chicken soup, minced onion, thyme, and fresh ground black pepper. Stir until combined and then spread the filling out evenly. 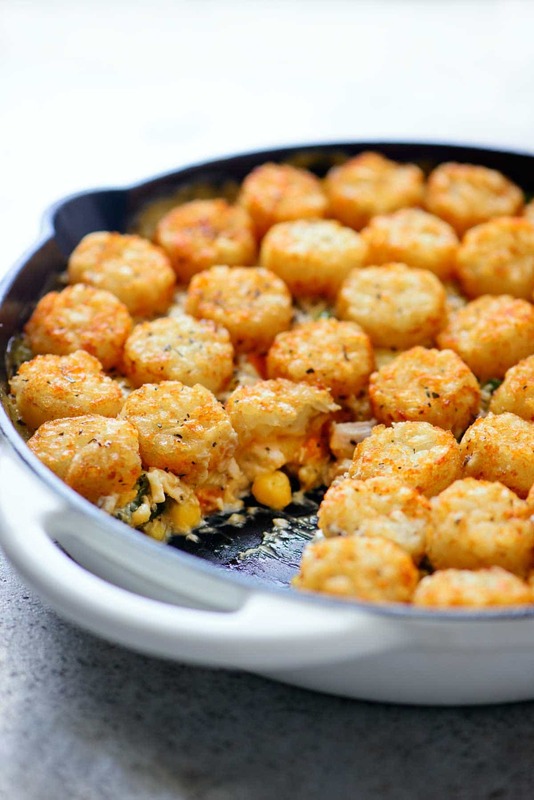 Cover the chicken pot pie filling with tater tots. 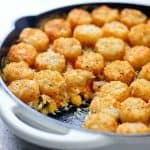 I used the flat, circle shaped tater tots called crispy crowns or potato crowns. Bake at 425° for 25-30 minutes, until the tater tots are golden and the chicken pot pie filling is hot and bubbling. You can garnish it with thyme, black pepper or even shredded cheese! 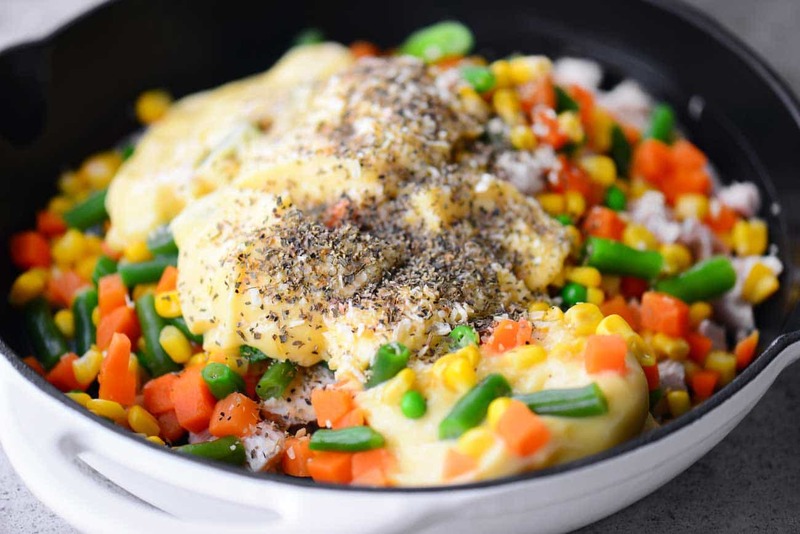 The Tater Tot Chicken Pot Pie is a fun spin on the classic with the potatoes on top instead of stuffed inside. 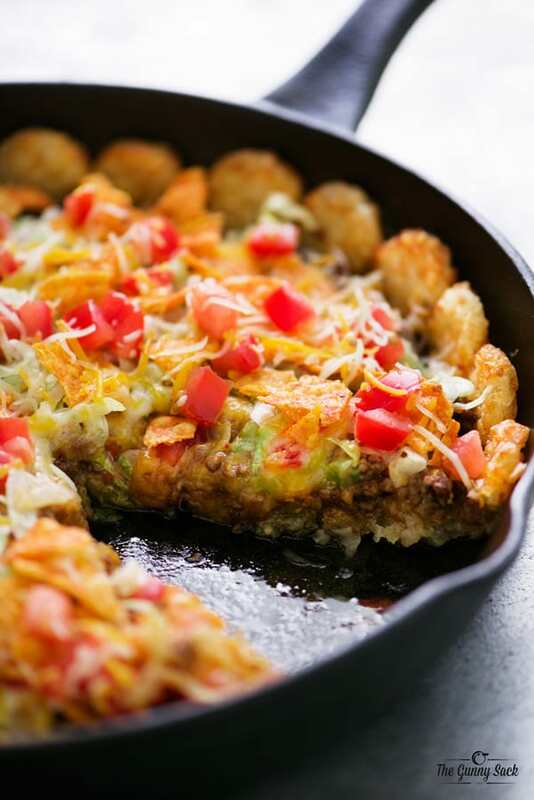 It’s quick to assemble and a recipe the whole family can enjoy. Add the chicken, veggies, soup, milk, onion, thyme, and pepper to a 10-inch round baking dish. Stir until combined. Spread out evenly. I have a friend who is in a nursing home. I spend a few hours every Sunday with her and last Sunday she was watching a food show that made Tater Tot Chicken Pot Pie She raved about how good it looked so I decided to surprise her with some tomorrow, which is Sunday. I looked through many of the recipes and found your recipe to be the best looking and easiest and judging by the ingredients I’m sure it will be delicious!. Can’t wait to try. Thank you.